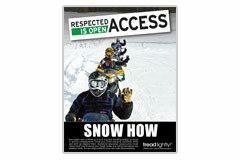 A comprehensive collection of downloadable and online access resources provides tools to help establish and retain access for snowmobiling. 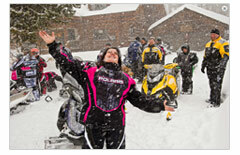 An online library of research studies related to snowmobiling impacts is also provided. Each of the following resources has been collected from various organizations and has been provided appropriate credit. To contact these organizations, please visit our FAQ page for a list of all organizations who contributed to this website. 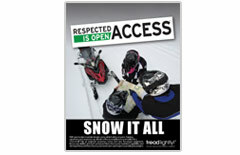 A wide range of brochures, manuals, ads, articles and education materials are available to help maintain and enhance access for snowmobiling. 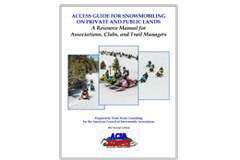 A resource designed to help snowmobile clubs, associations, and trail managers establish and retain permission for snowmobiling trails and areas on private and public lands. Access is about building relationships – no matter where or what types of land ownership. Chapter One discusses issues that can be obstacles to private lands access and provides suggestions on how to work with private landowners. Decisions regarding whether or not snowmobiling access will be allowed on specific pieces of property are clearly reserved for the owners of private lands and are most often driven by economic and risk management factors. Access to these properties often requires either a close working relationship with individual landowners or financial compensation for access to their lands – or both. It is also crucial that landowners be protected from any liability connected to their allowing recreational use of their properties. Chapter two outlines how to work with public land managers within the context of the rules they must follow. 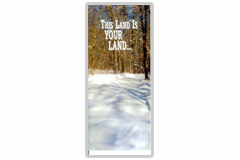 While snowmobilers are one of many ‘owners’ of public lands, snowmobiling access to these lands is not a right of ‘ownership.’ Public agencies of all types have been designated to manage the various categories of public lands. These agencies have the authority to allow or disallow activities on lands under their management, typically through various public involvement processes influenced by agency missions, policies, and social pressures. Access to public lands for snowmobiling requires participation in complex and lengthy agency rulemaking and planning processes, as well as establishing good working relationships with on-the-ground managers in these agencies. It also oftentimes requires efforts by snowmobilers to provide funding and volunteer partnerships to help public agencies accomplish their missions. More and more, public recreational access is being influenced by recreation groups – like snowmobilers – who bring resources to the table since public agencies have limited resources for recreation development and management. 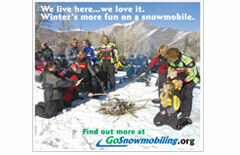 A resource to help state snowmobile associations recognize communities and businesses that cater to the needs of snowmobilers. 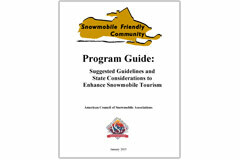 Communities and businesses designated as ‘snowmobile-friendly’ can benefit from enhanced tourism promotion opportunities. In turn snowmobilers can benefit from improved safety and access to services, along with easy recognition of communities and businesses that will cater to their trip needs. The suggested guidelines and considerations are intended to be customized by states and local communities to develop programs that best fit local circumstances. 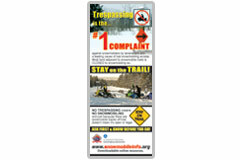 "Trespassing" audio PSA30-second PSA about snowmobiler trespassing from a partnership of the American Council of Snowmobile Associations (ACSA) with funding provided by the Recreational Trails Program administered by the U.S. Department of Transportation – Federal Highway Administration (FHWA). 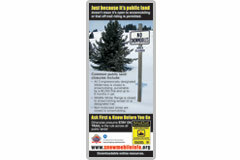 This 8 ½” x 3 ½” advertisement promotes smart snowmobiling on public land. Ask First, Before You Go. 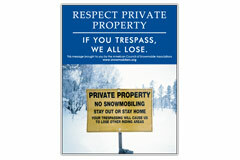 Vertical Poster of Snowmobilers and text "Respect Private Property. If You Trespass, We All Lose"
Quarter and half page ads (for both newspaper and magazine format publications) that feature the poster message is also available by contacting the ACSA office. 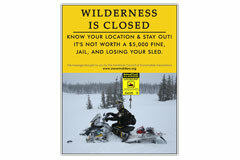 Vertical Poster of Snowmobilers and text "Wilderness is Closed. Know your Location and Stay Out. It's not worth a $5,000 fine, jail, and losing your sled." 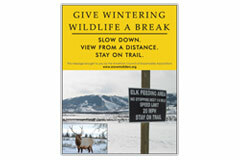 Vertical Poster of snowy mountain and text "Give Wintering Wildlife a Break. Slow Down. View from a Distance. Slow Down." 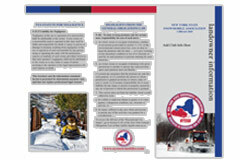 This tri-fold brochure developed by the New York State Snowmobile Association to help clubs provide accurate information to private landowners. An article written by John Pruzak, originally for Snowmobile Magazine and reprinted on the Minnesota United Snowmobilers Association’s website, stressing the importance of expressing appreciation to landowners who allow snowmobile trails to cross their property. 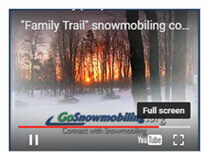 International Snowmobile Manufacturers Association (ISMA) offers over twenty downloadable ads promoting snowmobiling and snowmobiling access. 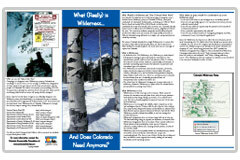 A brochure developed by the Colorado Snowmobile Association to help educate the public about what wilderness really is, and to stress that Colorado doesn’t need more Wilderness. 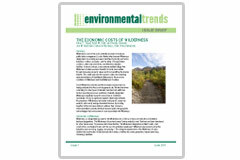 "The Economic Costs of Wilderness"
A paper by Brian C. Steed, Ryan M. Yonk and Randy Simmons – Jon M. Huntsman School of Business, Utah State University (2011) Environmental Trends; Summary: Some Wilderness can have positive economic impacts but our findings indicate that this is not the general rule. We find that when controlling for other types of federally held land and additional factors impacting economic conditions, federally designated Wilderness negatively impacts local economic conditions. Specifically, we find a significant negative relationship between the presence of Wilderness and county total payroll, county tax receipts, and county average household income. By working together with local communities to address their concerns, environmentalists can help develop balanced policy that genuinely acknowledges the local economic costs associated with Wilderness. Poster encouraging riders to take an avalanche awareness course, carry proper equipment, know their abilities and respect riding boundaries. 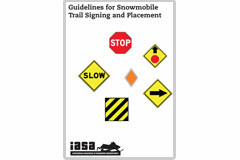 This document provides general guidelines for the effective placement of signs on recreational snowmobile trails. 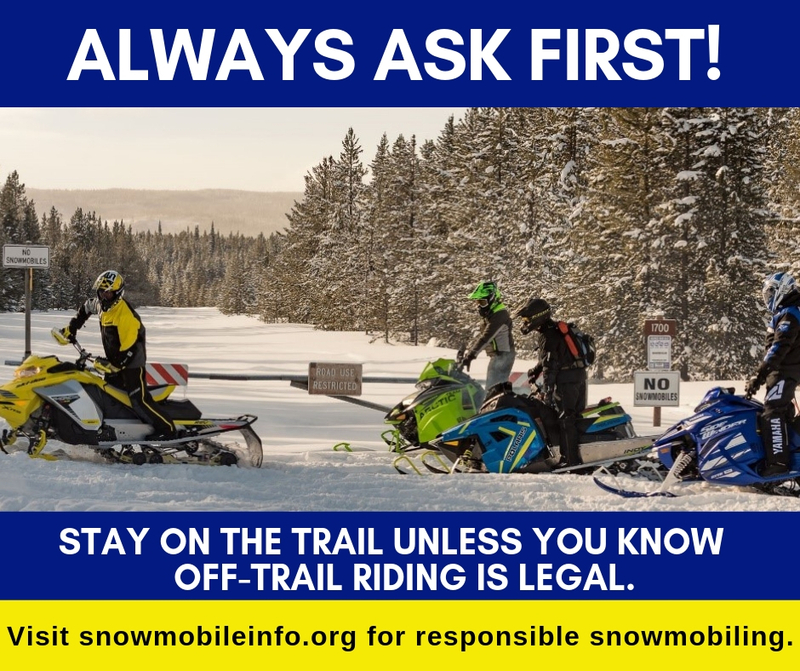 It was developed by IASA to provide minimum guidelines for regulatory, caution signs, and trail markers and which it is suggested should be applied to all officially designated snowmobile trails. 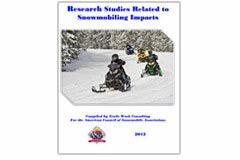 This compilation of scientific research provides web links or summaries from 160 studies related to snowmobiling impacts. 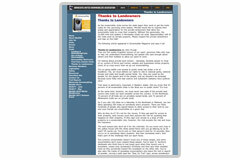 These studies can also be viewed in the library section of this site where over 120 studies can also be downloaded. 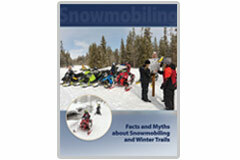 Whether old or new, this research information has relevance to present day discussions about snowmobiling access. Important perspectives can be gained by following the progression of knowledge forward in time, from old to new, as impact topics gain perspective with new research that either dispels myths or better defines real impacts. 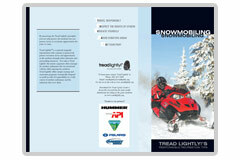 This compilation represents the ‘best available information’ about snowmobiling impacts. 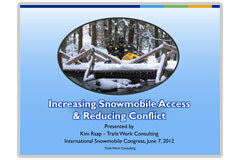 This project took an in-depth look at issues and effects related to the operation of ATVs on groomed snowmobile trails. Its intent was not to either encourage or discourage concurrent ATV use but rather to provide landowners, recreationists, trail providers, and political jurisdictions with better information to help them make objective local decisions. 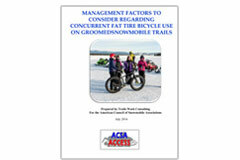 This report helps expand trail managers’ and local decision-makers’ knowledge about the potential effects of ATV use on groomed snowmobile trails during the winter season. All decisions regarding ATV use on groomed snowmobile trails are clearly reserved for implementation by local jurisdictions and local trail grooming managers consistent with their local priorities, conditions, and resources. 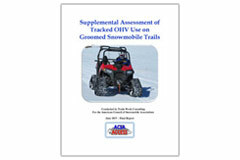 In this vein it presents a summary of findings, detailed results from field testing, and twelve factors that should be considered before making decisions whether or not to allow concurrent snowmobile-ATV use on groomed snowmobile trails. 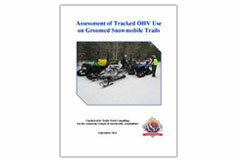 This project collected information about existing or potential tracked OHV use on groomed snowmobile trails. It does not advocate for or against allowing any type of OHV use on groomed snowmobile trails; that clearly must be a local decision based upon local circumstances. 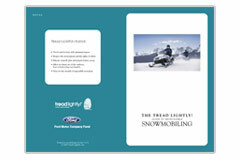 The report includes: 1) a compilation of ‘snowmobile’ definitions currently used by U.S. and Canadian jurisdictions since this is a primary means by which tracked OHV use can be either allowed or prohibited, 2) findings from a trail manager survey that identified current winter OHV use trends, 3) field test observations that compared snowmobile and tracked OHV impacts, and 4) general recommendations to help guide local trail management policies. 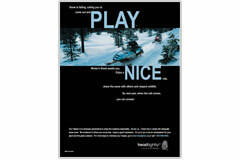 Allowing any type of OHV use on groomed snowmobile trails must be a local decision based upon local circumstances. Eight suggested best management factors are provided for trail managers to consider when deciding to either allow or disallow concurrent tracked OHV use on groomed snowmobile trails. This project builds upon information learned during the 2014 Assessment. It focuses on documenting tracked OHV operating characteristics and impacts in a wider variety of on and off-trail settings. It also broadened the tracked OHV database by observing and documenting tracked motorcycle operation on groomed snowmobile trails. It does not advocate for or against allowing any type of OHV use on groomed snowmobile trailsthat clearly must be a local decision based upon local circumstances. 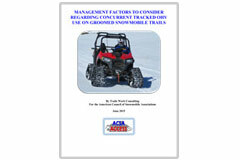 Findings from the 2014 and 2015 Assessments were integrated to develop ‘Management Considerations for Concurrent Tracked OHV Use on Groomed Snowmobile Trails to assist local trail managers, which are found in chapter two of this report. This report provides background information about fat tire bicycles, including perspectives from bicycling advocates involved with working to gain access to groomed snowmobile trails, to help snowmobile trail managers better understand potential issues and perspectives. The report does not advocate for or against allowing fat tire bicycle use on snowmobile trails since that is ultimately a local decision based upon local circumstances. Nine factors are suggested for trail managers to consider when deciding to either allow or disallow fat tire bike use on their local snowmobile trails. 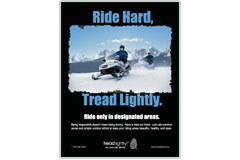 Allowing fat tire bicycle use on snowmobile trails is ultimately a local decision based upon local circumstances. Nine suggested best management factors are provided for trail managers to consider when deciding to either allow or disallow fat tire bike use on their local snowmobile trails. The U.S. Forest Service issued an amended Travel Management Rule (TMR) – Subpart C related to over-snow vehicle (OSV) travel in January 2015. 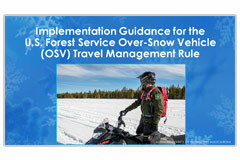 This OSV Travel Rule will affect all National Forest System lands where snowfall is adequate for OSV use to be allowed and requires that a system of roads, trails and areas be designated for motorized OSV use. Once roads, trails and areas are designated under Subpart C – all other OSV use is prohibited if not in accordance with the prescribed OSV use designations. Subpart C is distinctly different than Subpart B of the TMR which applies to all other motor vehicles. 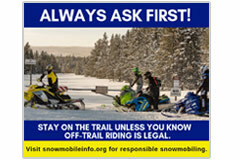 Consequently it’s important to understand those differences – whether snowmobilers, Forest Service employees, or other trail managers and users – to properly apply the OSV rule on the ground to help ensure an appropriate range of desired snowmobile riding opportunities remain available going forward. This resource includes a Power Point training program along with an implementation guidance manual developed by Trails Work Consulting and ACSA. 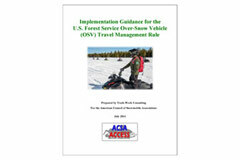 It provides: 1) an overview of the OSV Travel Rule, 2) an outline of the ‘six steps’ in the Forest Service OSV designation process, 3) guidance on adapting the ‘4 E’s’ to effective OSV travel management, and 4) an Appendix containing the Forest Service Travel Management Rule – Subpart C in its entirety, along with other associated pertinent travel management regulations. This resource includes a PowerPoint training program along with an implementation guidance manual developed by Trails Work Consulting and ACSA. It provides: 1) an overview of the OSV Travel Rule, 2) an outline of the ‘six steps’ in the Forest Service OSV designation process, 3) guidance on adapting the ‘4 E’s’ to effective OSV travel management, and 4) an Appendix containing the Forest Service Travel Management Rule – Subpart C in its entirety, along with other associated pertinent travel management regulations. 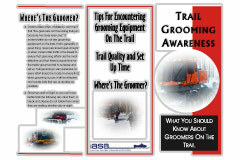 This PowerPoint training program was developed by Trails Work Consulting and ACSA to help grooming managers and groomer operators be adaptive to changing snowmobile trail grooming needs. It outlines numerous top grooming tips and includes illustrative photos, video clips, and detailed presenter notes. 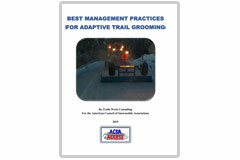 These Best Management Practices (BMPs) were developed by Trails Work Consulting and ACSA to help trail managers be adaptive to changing snowmobile trail grooming needs. They focus on overall trail grooming objectives, fleet management principles for grooming programs, the importance of off-season storage and maintenance, managing grooming operations, and controlling the most common wasteful grooming practices. 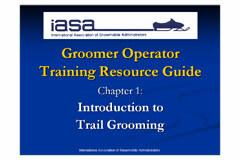 The manual's seven chapters cover an introduction to trail grooming; an overview of grooming equipment; managing grooming operations, equipment and safety; operating grooming equipment; maintaining grooming equipment; recordkeeping; and recommendations for groomer operator certification. 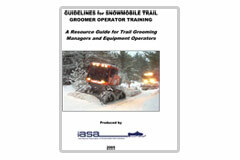 This series of over 500 Power Point training slides has been produced to accompany Chapters 1 - 6 of Guidelines for Snowmobile Trail Groomer Operator Training. 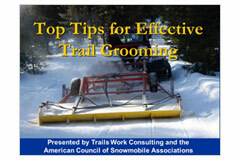 Tips for encountering grooming equipment on trails.